Real-world professional standards. Real-world deadlines. Real-world stories that need to be told. All in our nation’s capital. The Washington semester of the Newhouse broadcast and digital journalism graduate program is where students take all the journalistic skills they have learned during the past year and put them to the test in the news capital of the world. BDJ master's students are required to spend the last six weeks of their graduate program in Washington, D.C. During this capstone experience, you apply the hands-on and academic lessons you've learned from your previous semesters on the Syracuse campus at another level. 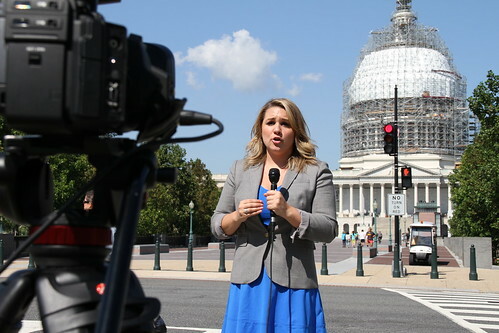 The majority of the class covers Capitol Hill and the federal government as reporters for television stations in markets as varied as Austin, Erie, Waco, Shreveport, Fort Wayne and Joplin. As a credentialed member of the Washington press corps, you will develop, research, shoot, report and edit your own stories, which then air on your assigned station's newscasts. Students interested in producing work with a variety of organizations. In previous years, we have placed students with CBS Newspath; WTTG-TV, the FOX station in Washington; Agence France Presse; NBC News; The Situation Room at CNN; and the Cox News Washington Bureau. We have longtime partners in Washington radio news and sports including WTOP News Radio and WAMU, the NPR station. A number of our students have used their skills across media platforms in our D.C. program, working in outlets such as USA TODAY. The capstone program is supported by faculty who bring to their teaching decades of experience covering Washington for local and network news operations. Students also benefit from the twice-weekly Speakers Series, in which journalists and Washington insiders share their observations about their profession and the unique challenges of making sense of Washington and those who work there.